After more than a week of prime mountain-biking weather, snow returns to the Colorado high country this week just in time for two ski areas – Copper Mountain and Keystone – to join A-Basin and Loveland and open for the season on Friday, Nov. 1. Vail opens for the season on Friday, Nov. 22. Wolf Creek Ski Area will open again for the weekend only on Saturday and Sunday, Nov. 2-3. The southern Colorado resort opens for the full season starting Friday, Nov. 8, joined that day by Breckenridge. This week’s system of storms will move in a series of waves, according to Opensnow.com, starting today (Oct. 29) and ending Friday, Nov. 1. 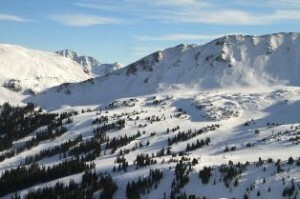 Anywhere from 7 to 14 inches could fall throughout a wide swatch of the Colorado Rockies, including the Vail Valley. After Breck and Wolf Creek open on Nov. 8, Winter Park is up next on Wednesday, Nov. 13, followed by Eldora and Vail on Friday, Nov. 22, Crested Butte and Beaver Creek on Wednesday, Nov. 27, Aspen/Snowmass on Thursday, Nov. 28, Purgatory on Nov. 29 and Howelson on Nov. 30. In December, Sunlight opens Dec. 6, Ski Granby Ranch Dec. 11, Powderhorn Dec. 12, Buttermilk, Aspen Highlands and Ski Cooper on Dec. 14 and finally Silverton on Dec. 21. The Mountain Top Express Lift (Chair 4) upgrade replaces a four-passenger chairlift with a new six-passenger chair (six-pack), reducing wait times at Mid-Vail. It also features a loading gate with a right angle load and a loading conveyor – a system that has been widely used at European resorts for years and is shown to reduce the number of lift stops and slows. Also, the Gopher Hill (Chair 12) upgrade replaces a two-passenger learning area lift with a three-passenger chair at Golden Peak, allowing instructors to bring two children with them on the lift.